Embrace agile as a technique, polish your skills to deliver successful projects and be a part of the rewarding project management industry. Get yourself certified and prove your worth! Be assured that this program is by far the best value-for-money. ExpertRating is an ISO 9001:2015 certified company offering online certification and training services to individuals and companies in over 35 countries. Over 25 million people in 35 countries have benefited from ExpertRating Online Certifications. ExpertRating is the exclusive provider of skills certifications on the world’s top-four marketplaces for services--upwork.com; bayt.com; guru.com; and flexjobs.com--and is trusted by thousands of employers for certifying employable skills. When it comes to certifying your skills as an agile project manager, it is advisable to go with a reputed organization that is well-accepted by companies and employers. The ExpertRating Agile Certification Program prepares you for the best agile practices that are globally accepted by the project management industry. This course has been created with the intent to provide you with the useful insights on the concepts, processes, knowledge areas, and the best practices for agile projects. It also provides practical knowledge for managing the projects. for managing projects. As the demand for project management professionals is on the rise, this agile methodology certification program will expand your familiarity with the concepts through real-life examples, which will actually enable you to put the guidelines and principles into practice in your professional life. 1. Which of the following options is NOT in the Agile Manifesto? a. Customer collaboration over contract negotiation. b. Responding to change over following a plan. c. Individuals and interaction over processes and tools. d. Working software over partial delivery. a. very often throughout the iteration. b. at the end of the iteration. c. at the end of the release. d. never during a project. 4. Which of the following options is NOT a part of a product roadmap? a. User requirements or features. d. Separation of critical features from others. 5. Which of the following options does not consider time value of money? b. Internal rate of return. d. Present value and future value calculations. The final test is fully based upon the Agile Methodology Courseware that is provided as part of the Agile Project Management Certification. If you go through the courseware properly, you should not have a problem clearing the test. The test consists of multiple-choice questions from different chapters of the Agile Methodology Courseware. The process of getting yourself certified is very simple. All you have to do is buy the ExpertRating Agile Certification Course for $69.99. Log in to your ExpertRating account using your password. Go through the Agile Methodology Courseware, which could take from one week to one month — depending upon how hard you work and your level of experience — and take the certification test at your convenience. You can take the test within one year of buying the certification course. The result of the test appears as soon as it is completed and your certificate is mailed immediately. 24 x 7 access to the ExpertRating Agile Methodology Courseware. You can access the ExpertRating Agile Project Management Certification course as soon as your payment is processed successfully, and you can complete your Agile Project Management Certification Course within one year of enrolment. You can buy this Agile Courseware (leading to Agile Methodology Certification) at a special offer price of only $69.99 that includes the in-depth Agile Methodology Courseware and the exam fee. This is the "best value-for-money" Agile Methodology Certification Program available till date. 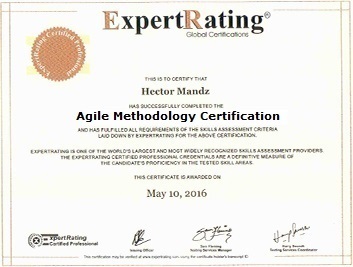 Worldwide airmail delivery of the hardcopy Agile certificate is provided. The certificate can be used to prove your certified status and does not mention the word "online". An online transcript is also provided that mentions your score and which you can use to prove your certified credentials on the Internet at any time. 1. What is an ExpertRating Certification? ExpertRating certifications are online third-party certification tests, which can be purchased online and taken from any location. ExpertRating certifications are widely used by job/contract aspirants and recruitment agencies as well as corporate houses for evaluating professional skills. ExpertRating certifications help individuals get hired faster because their résumé has the added credibility and recognition that comes with being certified. 2. What are the benefits of taking an ExpertRating certification? It will give your résumé that most wanted punch, which can help land you a dream job. It will help you to know where you stand relative to others in your field. It will allow you to gauge your actual level of knowledge through an independent and authentic assessment system. With the ExpertRating certification you can show the world that your skill level is at par with the best. It will certify your knowledge in a particular skill for which there is no other certification system available. The certification will give you an edge to approach for job interviews with added confidence by presenting your hard copy ExpertRating certificate of accomplishment to your prospective employer. 3. What are the system requirements? OS: Windows (any version above XP) or Mac (any version above OS X 10.6). Web Browser: Any modern browser such as Chrome or Firefox. Internet Speed: 512 kbps or above. 4. What is an ExpertRating test? ExpertRating Certifications can be earned by taking the skill specific ExpertRating online test. The tests have a timed, multiple-choice format and can be taken from any computer with an Internet connection. 5. Which certifications will I receive at the end of the course? Once you complete the course and clear the final test given at the end of the course, you will successfully earn the course-completion certificate from us, which will be delivered to your home address. 6. What if I’m not satisfied with the quality of the course material? If you are not satisfied with the quality of our course material, you can submit a request with us for a refund. We provide a hassle-free 100% refund guarantee. 7. What is an ExpertRating hard copy certificate? The ExpertRating hard copy certificate is awarded to all successful test takers who appear for a paid test or who buy a paper certificate after taking a free test. The certificate is of the highest quality and is suitable for mounting. The cost of the certificate and surface mailing charges are NOT included in the paid test fee. The hard copy certificate for paid tests can only be obtained by paying the required fee. In case of free tests, the certificate is not included within the free value. The hard copy certificate for free tests can only be obtained by paying the required fee. ExpertRating certified professionals the world over have used the certificate to their advantage by presenting it to prospective employers and recruiters as proof of their skills. A must course to augment your agile skills. Full of knowledge and practical illustrations. Very informative course! Though some of the chapters were quite long, but it’s worth taking. Go ahead. I have learned many useful things through Agile Certification program in order to enrich my interests and competence. I recommend it to all the curious and smart people! Affordable and influential in my success. A quality certification course at low cost. Easy to learn and comprehend! Excellent course! Thorough knowledge gained. In depth content with explanations. Value for time and money. Thank you so much! ExpertRating Agile Certification program will open multiple possibilities for you. The successful completion of this certification course will qualify you to become a project analyst, agile coach, agile program manager, scrum master, and agile business analyst. This course can open a gateway to giant organizations such as Microsoft, Sammons Financial Group, Fusion Alliance, McKinsey & Company and American Express. As an Agile project manager you will be a facilitator and guide for every member of the team to improve their performance efficiently. The certificate of accomplishment earned after passing the final test will represent your prowess in agile and project management. Apart from the lucrative employment scope, the overall market trend is bright and motivating for the agile project managers. PMI’s 2013 Project Management Talent Gap Report states that by the year 2020, the project management profession is projected to grow by over US$6.6 trillion. 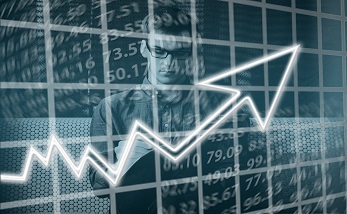 Though the U.S. Bureau of Labor Statistics (BLS) does not collect statistics on agile project managers, it reported a 12% growth for computer and information systems managers during the period 2016-2026. Furthermore, Payscale in November 2017, reported a median annual salary of $91, 293 for agile project managers. certified company, which reflects that our courses and tests conform to the highest international quality standards. PgMP, CAPM, PMBOK, PMP, PMI and PMI Today are registered marks of the Project Management Institute, Inc. © ExpertRating 2019. All Rights Reserved.